“I’m a New York City kid… I feel a responsibility to give back,” says the New York-based collector J. Tomilson “Tom” Hill, who launched the Hill Art Foundation with his wife Janine to share their collection and run educational programmes. The foundation is due to open its first home to the public on Saturday (9 February) in a new building perched on the High Line in Chelsea. “I wanted it to be in the traffic, in the flow… it’s not a destination,” Hill says. The foundation, which has free admission, will offer regular opening hours of 12pm-6pm from Tuesday through Saturday. This differentiates it from some other East Coast institutions founded in the past few decades by private collectors, such as Glenstone in Travilah, Maryland or the Brant Foundation in Greenwich, Connecticut, which are off the beaten path, and usually require appointments to visit. “We want the equivalent of ‘plug and play’ access,” Hill says. Pedestrians on the High Line can see into the new 6,000 sq. ft space, which is spread across the third and fourth floors of a new Peter-Marino designed mixed-use building. The foundation’s opening has experienced some delays; initially due to open in autumn 2017, the date was pushed back to January and ultimately this week. “Little did I know that construction in New York City, particularly when you don’t control the building, would be quite this complicated!” Hill says. The building is on the site of a former Getty petrol station, which makes for an especially complex construction process. “My view is, [founding this institution] is something that I’m interested in doing with my wife while we’re alive,” Hill says, and he wants “maximum flexibility” for his two daughters to eventually help decide what to do with the art collection, rather than establishing the Hill Foundation as museum, whether this means giving the art away, or selling it for funds for the foundation or other philanthropic endeavours. 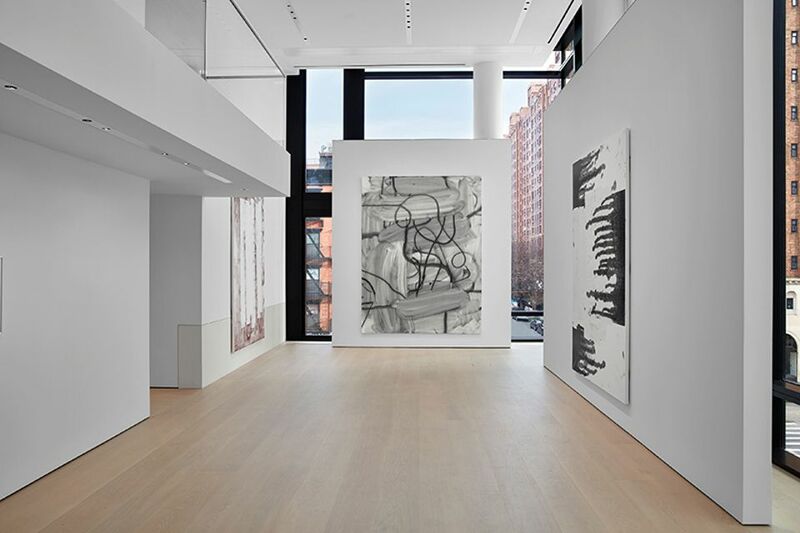 The opening exhibition Maybe Maybe Not: Christopher Wool and the Hill Collection (until 20 May), showcases the Hills’ impressive holdings of works by the US artist. Audiences got a taste of this last year in a Hong Kong show, timed to open with Art Basel in Hong Kong, of 15 works from the collection. Wool’s large-format works dazzle on the foundation’s first level, which includes a space with a two-storey ceiling. A more intimate viewing experience is provided on the upper level with two new black-and-white photography series by the artist, Yard and Road, which look at West Texas and were lent by Wool for the show. The foundation, directed by Sarah Needham, also plans to pilot an educational programme this spring for underprivileged New York high school students, focussing on art history and professional developments in the art and museum field. Hill wants to eventually help students find jobs and follow their future endeavours to gauge the programme’s success. Despite his interest in arts education, Hill is not a believer in “being didactic about art”. Rather, he describes the gallery arrangement as a “contemplative environment”, with seating to relax and take in the works. “I’m a strong believer that if you have good works of art, if they’re properly displayed and lit, that you can trust the viewer to make their own judgments about whether they like it, whether they find the connections,” he says.